Elevation Range: 8,000 - 11,000 ft.
Day 1: Meet in Gunnison, south of Aspen, at Colorado’s western mid-latitudes. We shuttle north 28-miles, to Crested Butte (pop. 1487; elev. 8885-ft). Occupying less than one square-mile, this 19th century mining town turned Colorado’s last great ski town is tucked immaculately into a broad valley. Passing the brightly colored Victorian homes, we find the modern if spacious Grand Lodge resort, our base for the next five days. After a fuel-up lunch, we take in a brief walking tour of the accommodations, as well as the adjacent Wildflower Spa (Crested Butte is, by the way, Colorado’s wildflower capital.) Swapping traveling clothes for riding gear we mount up, kicking if off with a close-to-town first ride. Dissolving into thick aspen groves, we’re ultimately swept into high alpine meadows dabbed and broad-stroked by a riot of wildflowers. Surfing the wildly varied and huge blooms that crowd, or occasionally cloud the trail, our route into the 1.6-million acre Gunnison National Forest closes out at Slate River Valley. Nonetheless you might be convinced we’ve ridden straight into a classic Coors commercial: jutting 12K peaks peering down on big valleys, girded by gently rolling hills. In relative terms, today’s ride is a Viking River Cruise compared to the majority of Crested Butte’s 750-miles of bike trails. Expect unparalleled view finding of 12,162-ft Mt. Crested Butte (three miles from town), as well as stunning Peanut Lake, a slice of Switzerland in the Colorado backcountry. The trail further showcases the 11,250-ft high Paradise Divide wilderness, thick with moose, elk, deer and Black bear; plus the 23-mile long Slate River, which flows from the Yule Pass. Day 2: Before the Mountain Bike Hall of Fame moved to Fairfax, CA it was based here. Now if there was a consensus choice amongst those who visited the HoF, the majority would call todays ride not just the best in Crested Butte… but the best in Colorado. Clearly, that’s as subjective as claiming the best street taco in all of Mexico. The heartier riders among us can choose to climb Gothic Road: an aptly named if preternaturally challenging trail beginning at 9600-ft. Gaining 3,025-ft, with a false summit at 12,000-ft, Gothic’s last mile climbs 1300-ft. Burly. Once on top though, the views are as horizon spanning broad as they are brilliant. To the east loom the Elk Mountains and the surrounding Maroon Bells/Snowmass wilderness. Spanning 181,535-acres, Maroon Bells can claim no less than six of Colorado’s 53 fourteeners: peak speak for 14,000-ft summits. Descending atop beautifully buff singletrack, you quickly begin to understand why the cycling intelligentsia, go-big aficionados to journalist and bloggers frame Crested Butte as offering some of the best high-altitude riding in the world. You can’t help but get your smile on, sweeping through brimming fields of wildflowers between expansive aspen groves. On a long descent, try not to get mesmerized by the kaleidoscopic rays of sunlight filtered by the aspen’s flitting and fluttering leaves. Day 3: Today we stage at the Crested Butte Mountain Resort Trail System. The ten-year old Evolution Bike Park—within the resort—accommodates every type of rider: female and family groups to those who defy gravity. Like a Baskin-Robbins for the fat tire set, Evolution features 30-miles of downhill and cross-country trails, a skills zone, a dual slalom course, plus any number of both natural and man-made obstacles. The park’s dedicated trails range from flagship lift-access downhill courses, beginner friendly lines scaled up to expert/Black Diamond category tracks. If you’re new to the mountain bike park experience, our local Escape guide acts as your personal liaise. Seeking the best way to bomb a trail, the proper technique to overcome a challenging feature, or you need to walkthrough an obstacle? A la Siri, we respond to any question, solve any mental block. Tonight, we share our respective anecdotes and the day’s highlights over a terrific meal at Crested Buttes’ best brewery, Elk Avenue. Day 4: Think of our penultimate Crested Butte ride as an XL pizza with the works. Bearing more names than a high-end law firm, the Reno Divide/Flag/Bear/Deadman’s extends 22-miles. Profiled by 2700-ft of elevation gain, today’s route links the Reno Divide with the Flag and Bear Creek trails. In figurative terms, expect nothing less than a classic; feature rich, and as buff as it gets. Set amidst the stunning Cement Creek area, a succession of big climbs give way to an equal number of superb downhill stretches. Fans of multiple plot twists will adore the final act: a descent comprised of no less than 28 switchbacks, culminating at Deadman’s Gulch. Day 5: Epic is the only way to describe our finale. Fast, flowy and full of variety, the Doctor Park trail is a favorite amongst Crested Butte locals. No more so than during autumn months when the aspens turn, the landscape seemingly paint-balled in sunny yellows, rich reds, and whimsical oranges. Measuring 23-miles end-to-end, Doctor Park kicks off at a heady 10,090-ft. Climbing 2800-ft., with an attendant 4400-ft of downhill, Doctor Park is predisposed to some technical moments. A few high ridgelines, bookended by big, embracing meadows and dense forest further distinguish it. After yesterdays’ ride, we can call an audible, running it as a shuttle. By virtue of Doctor’s connection to Crested Butte’s trail network, we can also add extra miles if you haven’t had enough Rocky Mountain high. Finishing with a trailside lunch, we shuttle back to Gunnison. The Grand Lodge Crested Butte Hotel is Crested Butte lodging at its finest. The Grand Lodge is a newly renovated full-service hotel located just 200 yards from the ski lifts. The Grand Lodge Crested Butte offers exceptional amenities, including a heated indoor/outdoor pool, spa, hot tub, fitness room, steam room, plus the Woodstone Bar & Grill. 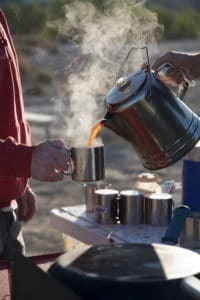 Camping gear may be rented or you may bring your own. All of our camping gear is tested and hand-chosen from top manufacturers to ensure you get a good nights’ sleep. 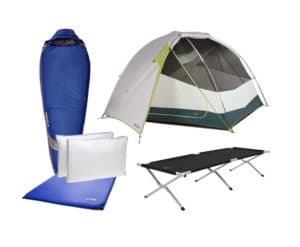 Our camp gear package includes a tent, sleeping pad, raised cot, sleeping bag, sleeping bag liner, full size pillow, and ground tarp.